When a couple is involuntarily removed from their cruise halfway around the world, does the cruise line owe them compensation? That’s William Coates’ question. Holland America booted him and his wife from the Westerdam in Korea just days into their 14-day cruise. Now he’s out thousands of dollars and he wants Holland America to pay. Coates’ plight is an unfortunate study of what happens if you don’t carefully review your cruise itinerary before embarkation. Each country on your cruise can have special entry requirements. And it’s always the traveler’s responsibility to know and possess all required documentation. If you don’t, you may find yourself in an unfamiliar, far-off land with the comfort of your cabin sailing away without you. And you’ll be left on the hook to find and pay for your trip home. For months, Coates and his wife anticipated this dream vacation set for October. The couple would fly to Japan and then board the cruise in Yokohama. Coates says that the problems began as soon as they landed in Narita. For some reason, the transfers that they had arranged with a Holland America cruise consultant never appeared. Regular readers of Elliott Advocacy may recall the recent story of Linda Combs, who booked her cruise through an NCL consultant. She paid for transfers, but the cruise consultant never arranged any transportation. This mistake was compounded by additional errors by the same cruise consultant and ended in the couple missing their cruise completely. Often when we publish an article about one consumer’s plight, our advocacy team soon receives a surge of similar complaints. And as I began plowing through Coates’ quite lengthy paper trail, I assumed that the missing transfer caused this cruise fiasco as well. What did cause this cruise fiasco? When Coates called Holland America to inquire about the transfer, he received the sage advice to get in a taxi and go to the ship. The refund for the transfers could be sorted out later. Coates and his wife made it to the Westerdam with plenty of time to spare. Annoyed by the minor inconvenience, but happy to be onboard their much-anticipated cruise, the couple began to unpack. But the missed transfer was nothing compared to what was in store for this couple. On day 3, they received the shocking news that they would be removed from the cruise at the next port of call. Coates says that the Holland America employee told the couple that they needed visas to enter China. This was the first time Coates or his wife had heard of this requirement. They tried to reason with the crew member and find some alternative to their removal from their cruise. Unfortunately, there wasn’t any alternative at that point. Missing visas, like passports, are not something that a foreign government’s border control will overlook. These documents are official pieces of identification and aren’t negotiable by the crew of Holland America or any other cruise line. China requires all U.S. citizens to possess a visa for a cruise that visits multiple ports of entry. This information can be found on the Department of State’s Bureau of Consular Affairs page on China. Obtain a visa prior to arrival and have a passport with at least six months’ validity remaining. The lack of either will result in a fine and immediate deportation. But the couple had not familiarized themselves with this information and had not obtained the required visas. The outcome was inevitable. Is Holland America’s cruise consultant at fault? When Coates contacted the Elliott Advocacy team, it was just days after the couple had been summarily removed from their cruise. The two were still in shock at the turn of events. He placed the blame for their missed cruise on Holland America. Getting thrown off the ship was a most embarrassing and difficult experience for us. Our loss is approaching $9,000! Holland America should have alerted us to our missing travel visa and the stringent requirements. No one did. We think that something this serious would be part of the travel professional’s responsibility. Coates maintained that although he had worked directly with a Holland America Cruise Consultant, that planner had never mentioned the required visas. Coates said that he and his wife had no idea when they took off for Japan that they were missing any needed documents. I carefully reviewed all of Coates’ correspondence with Holland America. If it was true that their Personal Cruise Consultant, an employee of Holland America, had never even mentioned their need for a Chinese visa, I thought Coates might just have a basis to request a refund of some of his expenses. However, this turned out not to be the case. All of the information that the couple needed to avoid the eventual removal from their cruise was right in front of my eyes. In multiple places. In their own paper trail. 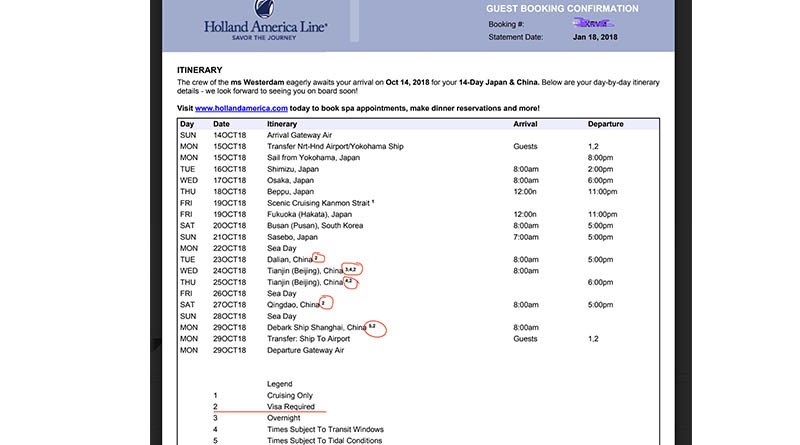 The itinerary that Holland America sent to Coates in January 2018, confirming the cruise, indicates that China requires a visa. It is the Guest’s sole responsibility to obtain and have available when necessary the appropriate valid travel documents. All Guests are advised to check with their travel agent or the appropriate government authority to determine the necessary documents. You will be refused boarding or disembarked without liability for refund, payment, compensation, or credit of any kind if You do not have proper documentation, and You will be subject to any fine or other costs incurred by Carrier which result from improper documentation or noncompliance with applicable regulations, which amount may be charged to Your stateroom account and/or credit card. And directly on the contract was another warning that each country will have its own entry requirements and guests are responsible to know them. Coates’ case was sinking fast. I continued to search through his emails with Holland America to see if there might be some missing clue. Why wasn’t the duo aware of their need for a Chinese visa? Holland America’s answer to Coates’ request for reimbursement for all expenses related to the removal from the cruise, was a firm no. In fact, Holland America provided evidence that not only did the contract show the needed visas, but the reservation department had also sent two additional alerts to the couple. Our Reservations Department also advised us that we sent you at least two notifications specifically about visas and that they are required. We regret if you did not read these notifications. Lastly, Holland America detailed that the crew on board the Westerdam had made a plea to the Chinese authorities. They requested an emergency visa for the couple. Additionally, they had offered that the couple would remain on the ship during the multiple stops. The Chinese border patrol rejected all of the alternatives. Holland America had no choice but to remove the couple from the ship before it entered China. So why didn’t Coates read any of the alerts or the contract from Holland America before October? We spend the summers in New York and we did not have access to the computer from June through September. Our daughter was checking the email and once we returned to our home here, we tried to print out the emails referenced. We could not open the links and therefore were unable to review any communications. Regardless, no one alerted us to any problems. As could be expected, this explanation does not shift the responsibility for this expensive cruise mistake from Coates to Holland America. Although I would love to be able to obtain a refund for the Coates, in this case, the facts don’t support his request. Coates had the contract and the payment schedule from January. That contract noted the Chinese visa requirement. Before you set off on any cruise, it’s imperative to read the contract in its entirety. Remember that your entry requirements are unique to you, and it’s your responsibility to obtain all necessary documents. The Department of State’s page dedicated to cruise ship passengers is an excellent place to get you started on this task. In the end, Holland America refunded the couple for their unused return airfare as a gesture of goodwill but declined any other refund. Should Holland America reimburse Coates and his wife for their missed cruise and additional expenses? Posted in #8: Counting down the most popular stories of the year at Elliott Advocacy, Advice Tagged CRUISE FIASCOS, DON'T FORGET TO GET YOUR CHINESE VISA BEFORE YOUR CRUISE, HERE'S ANOTHER KICKED OFF THEIR CRUISE STORY, HERE'S ANOTHER MISSED CRUISE STORY, KICKED OFF OUR CRUISE!, MISSED CRUISE STORIES, PROBLEMS WITH HOLLAND AMERICA!, WHAT HAPPENS WHEN YOU GET KICKED OFF YOUR CRUISE?, WHY WERE THEY EJECTED FROM THEIR CRUISE?